James Boswell (1740-1795) was a lawyer and writer who studied briefly at the University. His acclaimed Life of Samuel Johnson, LLD (1791) is one of the most popular biographies written in the English language. Born in Edinburgh, the son of Lord Auchinleck, Boswell matriculated in 1753 to study at the city's University. In 1759 his father sent him to Glasgow, where he attended the classes of Adam Smith and others, but he tired of student life and fled to London on 1 March 1760. He became a lawyer, a writer and, and most famously the biographer of the polymath Samuel Johnson. Boswell met the famous Corsican nationalist Pasquali Paoli during his travels in Europe, and renewed his acquaintanceship when the latter was exiled in London. In 1771, Boswell brought Pasquali and the Polish ambassador Count Burzyuski to visit the University. They were greeted by several professors and a large crowd of spectators, and toured the printing works and the Academy of Art with the University printers Robert and Andrew Foulis. In the autumn of 1773, Boswell and Johnson set off on their famous tour of the Western Isles, recorded in Boswell's famous The Journal of a Tour to the Hebrides (1785). 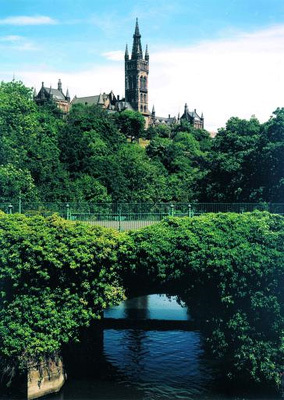 They stopped off in Glasgow on their return, and stayed at the Saracen's Head Inn near the University. On 29 October, Professors Stevenson, Reid and Anderson breakfasted with them at the hotel, and they visited Principal Leechman at his house in the College. That evening, they dined with Reid, Anderson, and the Foulis brothers. Born 29 October 1740, Edinburgh, Scotland.